Sunday morning. 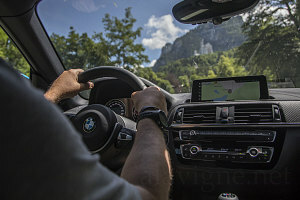 With the M2 now received and ready to roll, and with access to the Swiss flat now in our hands, I was excited and primed to try out some spirited twisty road driving. But no, not quite yet. 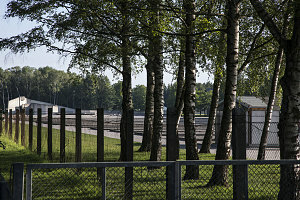 We still had to get one intermediate objective out of the way: the break-in period for the car. I wanted it to be complete, along with the required post break-in maintenance service, before we really started pushing the car. All of our focus would now be bent towards this objective, because the parameters were tight: I had a scheduled appointment at a BMW dealer in Switzerland for the very next day - Monday - and in the morning, at 8 a.m. An appointment by which time the we had to have accumulated approximately 2000 km of pre break-in driving. The odometer on the M2 was currently at about.... 300 km. So, let's see here... super complicated back of the napkin calculations.... chug chug.... we needed to put about 1700 km of driving on the car in the space of the next 24 hours.... (!!!). This was indeed going to be a challenge. At least Luke and I would be able to switch back and forth as we embarked on what would surely be a marathon driving session. 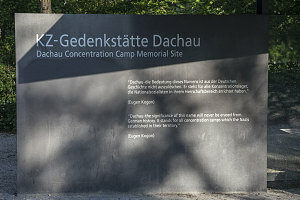 First off, we had to drive back to Niederstotzingen. I had forgotten to give Asmir and Miriam something of theirs when we had visited the day before, so we had to do that first. No problem, we needed to put the miles on anyway. 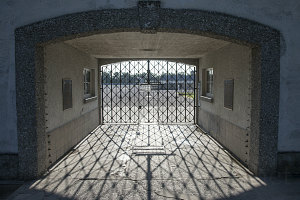 I elected to take a wandering route (instead of the shortest), and on the way through various German back-road towns, we drove by a grim historical monument - the Nazi-era Dachau Concentration Camp. We stopped briefly to pay respects. At the early hour at which we had arrived, it was as-yet unopened and completely devoid of people - which made it even more somber. After Dachau, we wound our way west along many quiet backways, through many pretty little German towns. We were impressed with the quality and maintenance level of the roads, as well as the quite generous speed limit of 100km/hr on fairly non-arterial countryside roads. After stopping briefly to meet with Asmir and Miriam, we turned south, returning to the Autobahn to up our average speed and get more kilometres on the odometer. 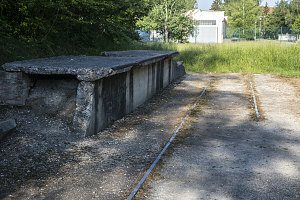 Soon the line of the Bavarian Alps could be seen in the distance. 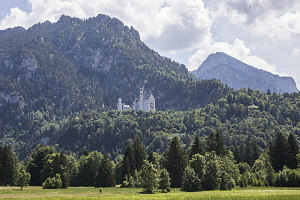 We turned east near the famous castles of Neuschwanstein and Hohenschwangau - the former the inspiration for the iconic Disney castle. I had contemplated stopping for a quick visit, but it was plainly apparent that we were not racking up the kilometres fast enough to allow a multi-hour stop. 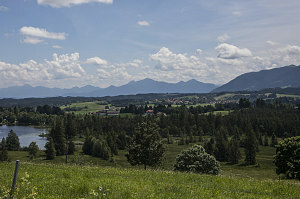 A few snaps from the road's edge and we continued on, driving roughly east on various backroads along the foothills of the Bavarian Alps. It was a beautiful, sunny afternoon, and apart from perhaps maybe a bit too much road traffic for our liking, conditions were perfect. 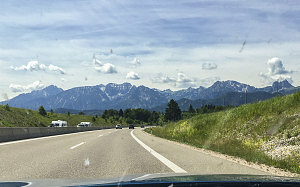 Although the backroad driving was more pleasant, we eventually merged back onto the Autobahn just west of Salzburg, which we then took into Austria. We turned south (no time to stop in Salzburg, as nice as it is), making sure we didn't exceed the 130km/hr speed limit (unlike Germany, Austria has no "unlimited" autobahn sections). We turned off of the Austrian Autobahn onto our first real mountain road of the trip: B-164. Even though we couldn't apply full throttle or go to redline, the M2 was clearly at home as we climbed up into the mountains here (known as the Berchtesgaden Alps). 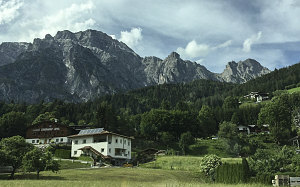 Although we were enjoying our drive through the mountainous Austrian countryside, it was now mid-afternoon. We had at this point covered about seven hundred kilometres since leaving Munich in the morning, meaning we were at about roughly 1000km of elapsed total mileage. It was daunting -- very daunting -- to think that we needed to put 1000 more kilometres on the car before 8 a.m. the very next morning. 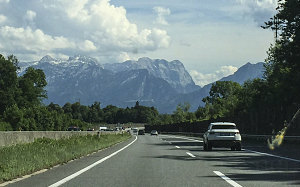 We hopped back on to Autobahn in the Inn valley and drove west down it, passed the Olympic city of Innsbruck, towards Switzerland. Maximizing our kilometers driven per hour was the key concern now. Secondarily, we wanted to arrive at the Swiss flat at a decent hour. There were adjacent neighbours, and we didn't want to be strange foreigners who mysteriously arrived in the middle of the night. Based on the distance remaining to the flat, it was clear that after arriving and unloading our stuff, we would need to find some additional hours to put yet more kilometres on the car. I'm sure it will come as no surprise that Luke and I became increasingly tired as we motored west across Austria. By 7pm we had crossed into Switzerland (via a brief visit through Liechtenstein). By dusk we finally were driving up the valley of the Vorderrhein, and finally the narrow switchbacks up to the small mountainside town of Waltensburg and to the flat. As we fiddled with the key to let us into the flat, one of the neighbours (a friend of the Roemer family) came out to see what was going on. In my broken German, I introduced us and reassured her that we'd come with the blessing of the family. We had been driving since about 7 a.m., with only the briefest of stops. 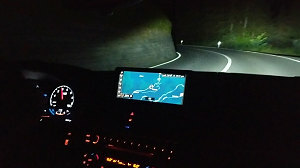 We had covered about a thousand kilometres during that time - which as an overall average speed is really not that bad. But it wasn't enough, no. Not nearly enough. The total mileage on the M2 stood at about 1350. Now only twelve hours left until our 2000km service appointment. But oh, were we tired. As we had been driving through Switzerland, I had formulated a plan to try and manage: arrive at the flat, and immediately crash (i.e. sleep) for a few hours. Enough to get us safe to drive again. Then get up, maybe somewhere around 11pm, and put a few hundred more kilometres on the car. Then come back to the flat and get some more shut-eye until first light. Then get up and drive down to the city of Chur (about 30 minutes away), where the BMW dealership was located. 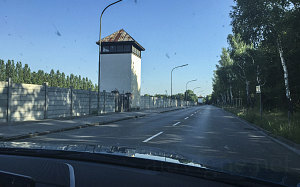 Then drive back and forth along the nearby Swiss autobahn until 8 a.m. Whatever mileage we had on the car at that point would have to do. Another delicious breakfast and nice checkout from the hotel. Time for some open roads as we escape the clutches of Munich. Wait, it's Sunday morning, so there's no traffic whatsoever. The start stop feature is remarkably good on the M2 and we've discovered it does have a hill start feature too. Nice. 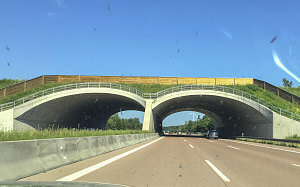 Up onto the autobahn and an easy cruise control set at 170 km/h. Effortless. Feels like we are driving at 120 on the 417. A quick gas and coffee stop at Miriam's and we are in our way. Found my sunglasses. Heading down towards the famous castles close to the Austrian border. Hitting some traffic though, so time to turn north and get back to the autobahn for some fast mileage. At 2:44 we still have only done 900 kms. Gonna be a late night again. 10:20pm - we made it to the flat in Switzerland. 1400 kms on the car so we are having a quick refresh stop and then going back out for another 400kms. Then the M2 will be ready for the break in service tomorrow. Phew! Photo radar flash. 90 in am 80 zone. Hope there's no ticket. Seems dangerous to flash people at night. 2:30 am - Ok, a long day done. 4 hours sleep and then we have to put the last 200 kms on the car before taking it in for service. After that, M2 unleashed. Luke and I power-napped, fully-clothed, until about 11pm. Perhaps two or two-and-a-half hours of sleep at most. We then very quietly headed back out to the M2 and gently but quickly drove off (the exhaust on the M2 is fairly burbly at startup). 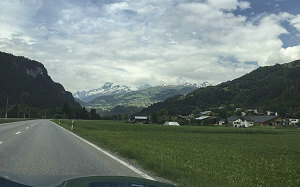 Back down through the narrow streets of Waltensburg (where absolutely no one was about), down the switchbacks to the valley's main road, back down towards Chur, and onto the Swiss Autobahn (which have a maximum countrywide speed limit of 120km/hr). We drove partway down the highway towards Zurich for about 90 more minutes, then turned around and headed right back the same way. In one section of construction (again, completely deserted at 1 a.m. in the morning), a couple of bright flashes startled us. Immediately I figured them to be Swiss photo-radar cameras. I looked down at the speedometer - we were only going 90km/hr in an 80km/hr marked zone - but it was a construction zone, and the Swiss are known to be pret-ty picky about rules and things, so... sigh. I thought "...crap... just what I need... a nice fat ticket..." (turns out I never got a ticket, so maybe some official looked at the footage and the time and the speed and realized that maybe it would be a little too draconian to give out a ticket for this). Both feeling heavy-lidded again, we pulled back up at the flat somewhere around... 2 a.m.? 3 a.m? Plenty late, in any case. Feeling rather dishevelled and rumpled and tired and grimy (and therefore in need of a good shower), we nevertheless crashed straight away for a few more hours of much-needed sleep. I set my alarm for about 5:30 a.m., roughly around sunrise.